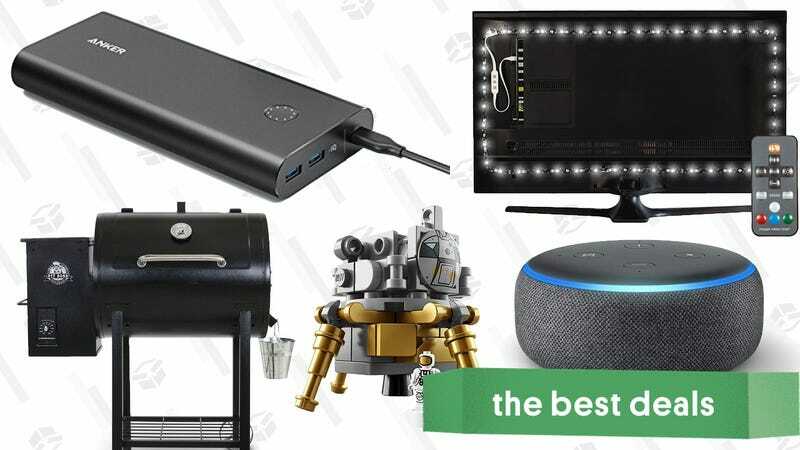 A one-day sale on fast-charging Anker gear, our favorite HDTV bias lights, and an affordable wood pellet smoker lead off Friday’s best deals. Amazon announced a whole bunch of new stuff today, from refreshed Echo devices, to a smart microwave, to an analog wall clock that doubles as a visual display for your Echo kitchen timers. Preorders for most of the products should be available today, and we’re adding links to all of them over on this post. Normally priced at $100, you can save $10 today by clipping the on-page coupon. I know, I know. $270 is a lot to spend on an air purifier. Let alone a refurbished one. But come on, look at this thing. With no visible blades, you could put your arm straight through the Dyson Cool Link. It also has a true HEPA filtration system (those don’t come cheap, even from other manufacturers), and with built-in Wi-Fi, you can even control it and monitor your room’s air quality from your phone, even if you’re away from home. Just note that today’s deal is only available today, or until sold out. BCOZZY Travel Pillow | $24 | Amazon | Promo code kinjafirst. Code takes 20% off entire catalog: More fabric options here. You can read more about the BCOZZY here, then head over to Amazon to get one for 20% off with promo code kinjafirst. That’ll work on both the adult and kid sizes. Whether you wear TOMS for the ease of never having to tie your shoes, or just dig the style, this is one deal you should take advantage of. They just relaunched their Surprise Sale, with up to 50% off dozens of styles for men, women, and kids. Now you have an excuse to throw out your old, gross ones. Merrell is best known for quality hiking footwear, and you can get a piece of that for less. Right now, they’re running a Private Sale with a bunch styles of footwear for men and women, just in time for the perfect fall hiking weather. Some items are an extra 40% off as well with promo code MERREELLFIRST40, but if that doesn’t work, try SAVE20SALE for 20% off. Some styles have a couple colors to choose from as well, and you’ll also find some outerwear thrown in for good measure. If you want the official Super Smash Bros. Ultimate game guide, either for competitive or decorative purposes, preorders are up for both the 208 page paperback and 352 page collector’s edition hardcover. Both are already well below MSRP, and if prices drop any lower prior to release, you’ll automatically get the best price. In our experience, that happens quite frequently with game guides.